News that the Privy Council had zero documents in response to 23 requests for access to information made me laugh (and roll my eyes). 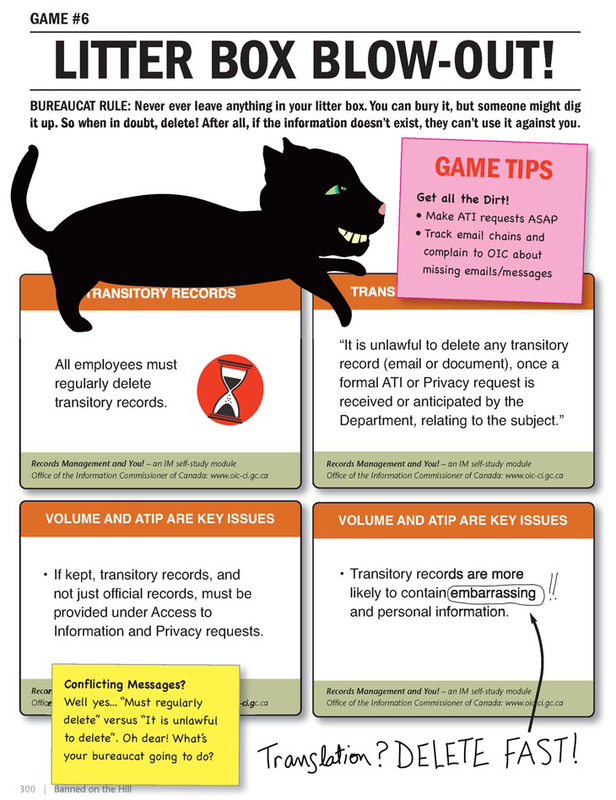 Yes, those darn Bureaucats are up to their old tricks! I am very familiar with their methods to dodge accountability having submitted over ten ATIP requests since 2011. Now you might think that since I received 2,172 documents from four different Federal departments (including the Privy Council) it was easy. No, no, no, no. Far from it. Fortunately, I have what my parents used to call “stick-to-it-ive-ness”, so despite being told — by Environment Canada — that there were zero documents, I kept on their trail. 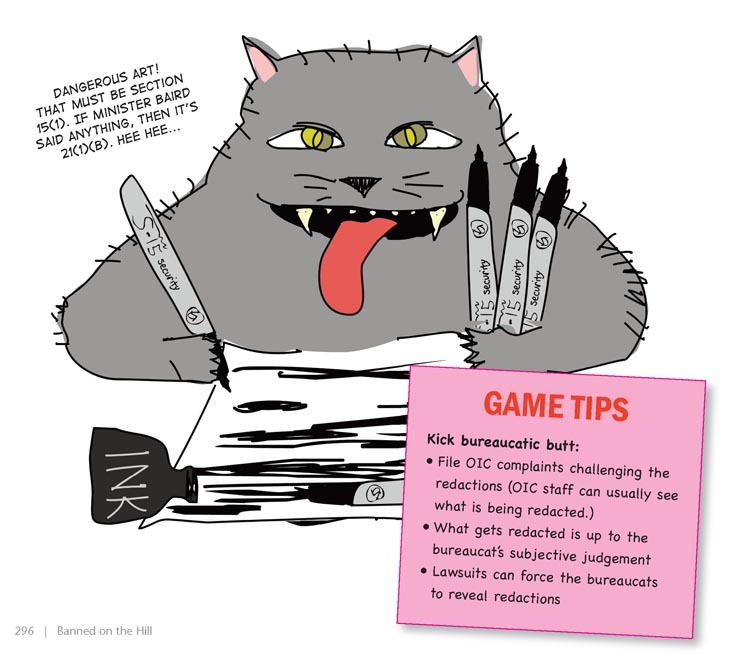 Read more below in excerpts from the chapter, Games Bureaucats Play, from my new book, Banned on the Hill. They are all games I experienced firsthand, while digging for the truth about the Harper government’s interference in my climate change art show in 2011. 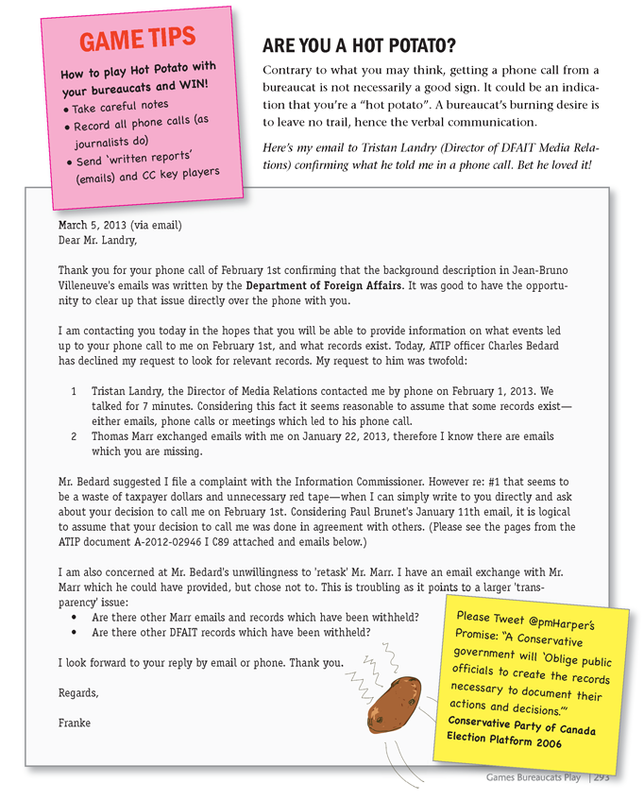 In the email chain above, Vlatka Ljubenko, the Cultural Officer at the Canadian Embassy in Croatia, (who was at the center of the whole messy Banned on the Hill affair) is writing to Peter Egyed, Councillor for Public Relations, Culture and Academic Relations at the Canadian Embassy in Rome. They are discussing what news Jeremy Wallace, Deputy Director of DFAIT’s Climate Change Office had to share about my proposed art show in Europe. By having phone calls they are able to dodge accountability. Critics have asked that the ATI laws be strengthened so all government decisions are recorded in writing. 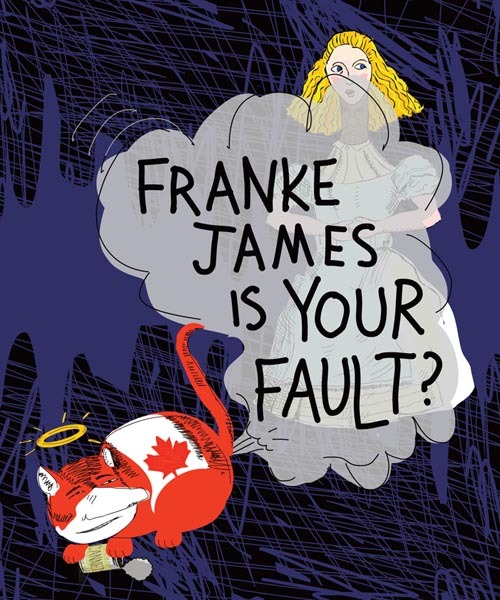 Sometimes the Ottawa masters, and their sneaky little Bureaucats, slip up. They accidentally write down the truth. That’s when the black markers come out to censor whatever they foolishly put in writing. Art about climate change? That must be labelled a dangerous threat to international security and dirty oil, S.15(1) International. If a Minister was involved that could be blacked out under section 21(1)(a) or 21(1)(b). I’d wager that embarrassment to the government is a major reason discussions about my art were blacked out! But I knew that was not true. 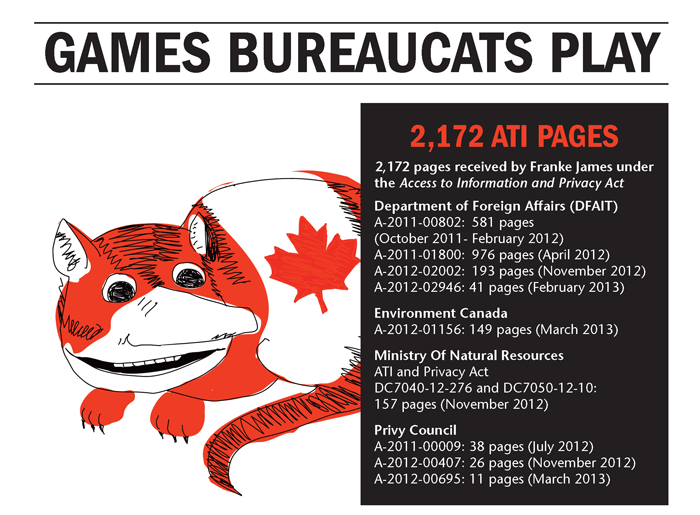 They had to have SOMETHING — because ATIP documents from the Department of Foreign Affairs showed conversations with high-level officials at Environment Canada! 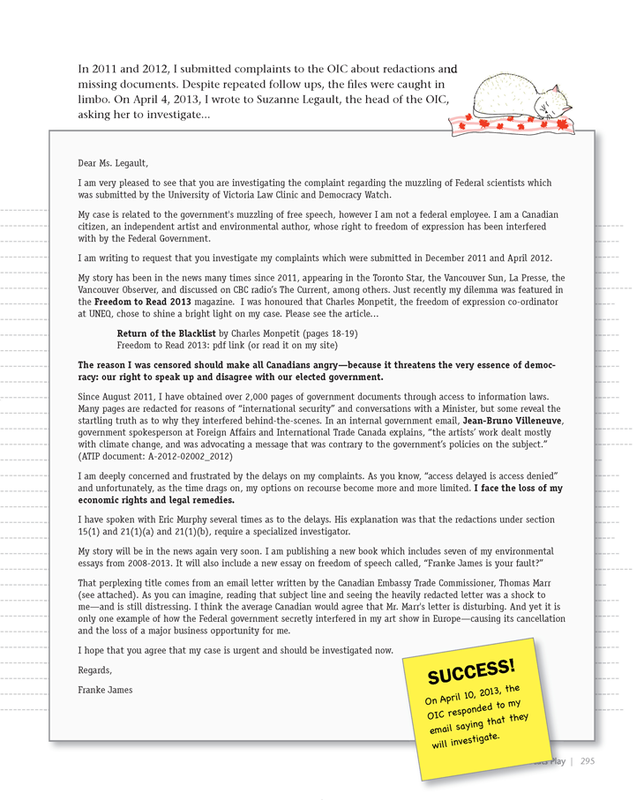 Finally, in February 2013, after more than one year of pursuit, I received 149 documents from Environment Canada. 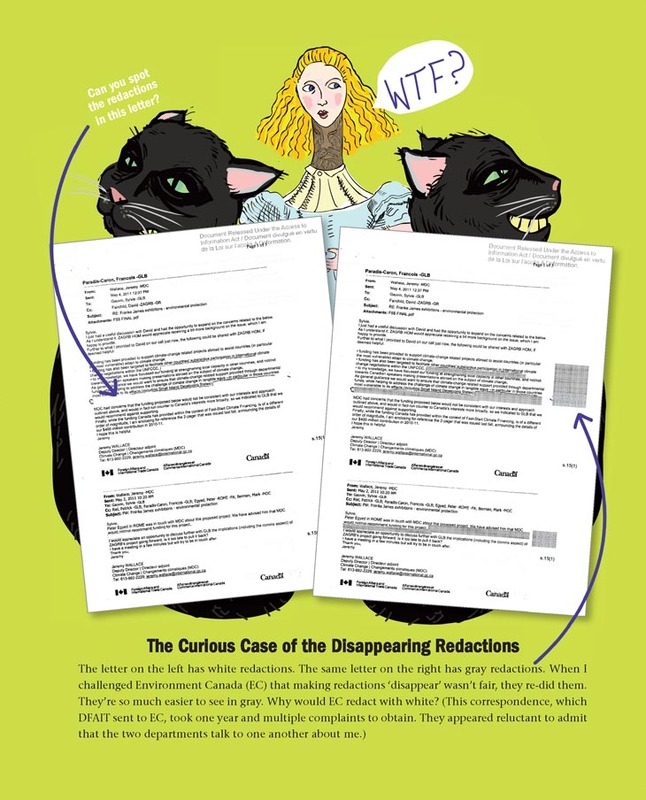 See The Curious Case of the Disappearing Redactions illustration above which contrasts two identical documents — one with white redactions and the other with gray. Hmmm… why would Environment Canada want to hide the extent of their redactions??? 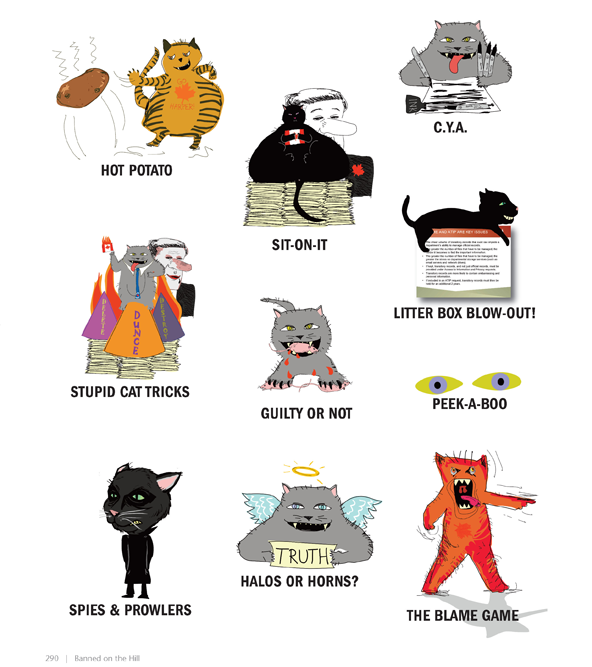 Moving on… Let’s look at their next favourite game, Litter Box Blow-Out. 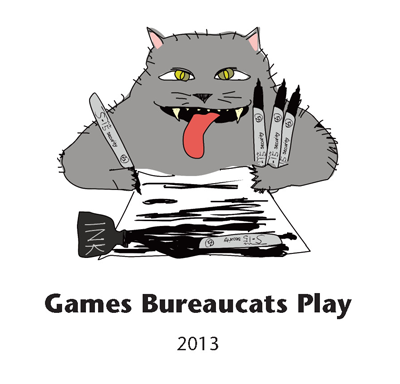 Surely the Bureaucats must be accountable to some authority? Amazingly the OIC quickly responded! And they assigned an investigator! Woohoo! I was optimistic that they would get the redactions uncovered and secure the missing documents. The investigator was confident she’d get to the bottom of it quickly. However time drags on. It’s now six months later and there’s no news. 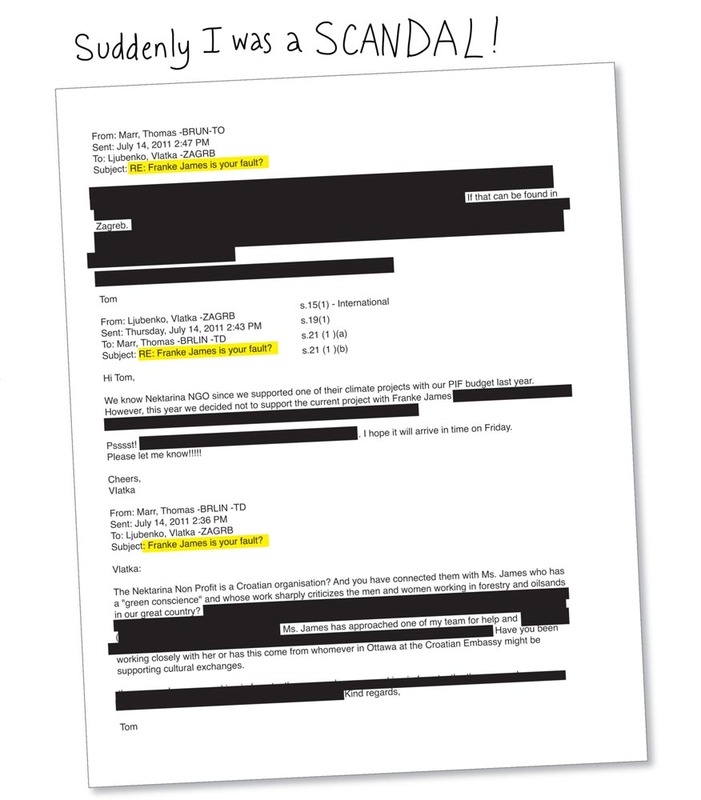 Which really piques my curiosity… What IS under those redactions? What is the government HIDING? 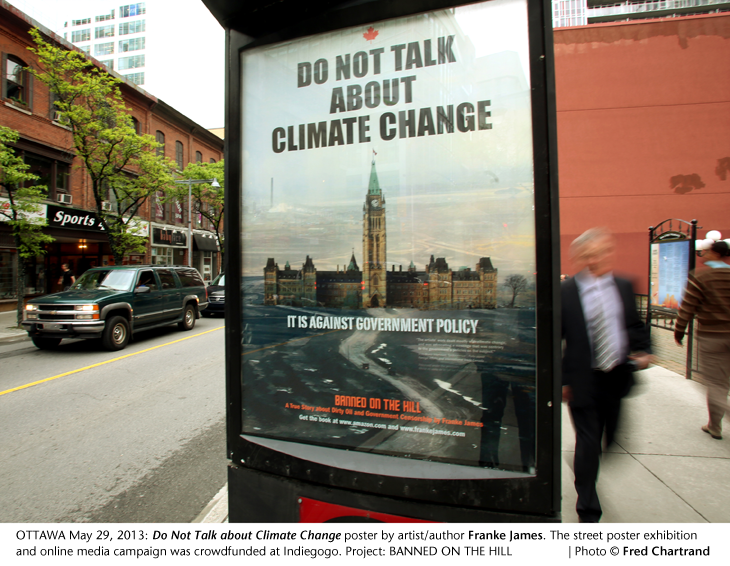 The spokesperson’s words are memorably featured on my “Do Not Talk” poster which was up on the streets of Ottawa — and will be going to more cities in 2013. Stay tuned! 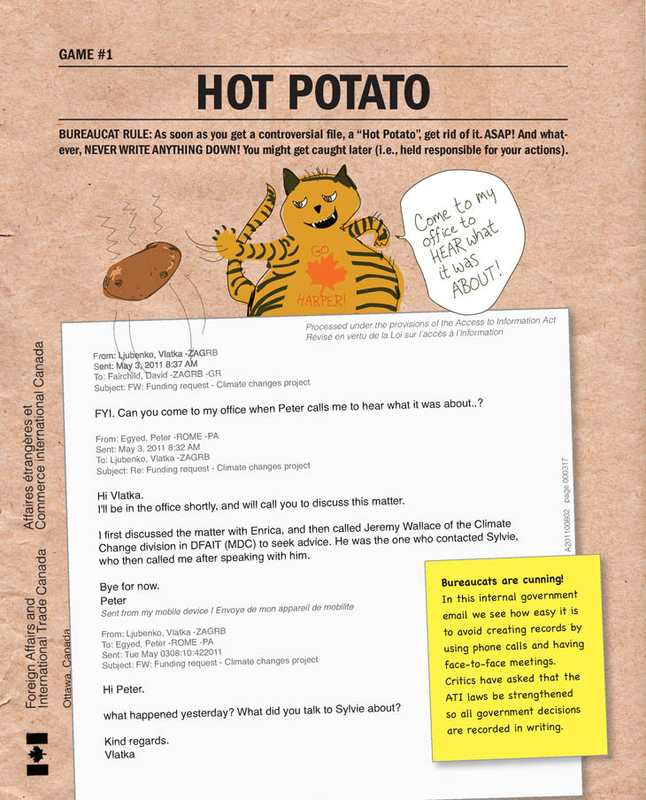 We want to get a lot more people talking about climate change! And Orwellian Ottawa, through their oppressive tactics, is helping! Are YOU on Stephen Harper’s #‎EnemyList?